What's High Pressure Processing? Why Arlee's Raw Blends Doesn't Use It? High Pressure Processing or H.P.P. is a form of pasteurization that preserves food and beverage products for a retail shelf life of thirty days or longer. This is new form technology that you will see some raw juice companies using. We have included a link to the FDA that goes into further detail about H.P.P. Juice is shipped from Company A to a H.H.P. processing plant. Juice is loaded into a high pressure chamber and up to 87,000 pounds of pressure is applied for five minutes. Juice is then removed and shipped back to Juice Company A. 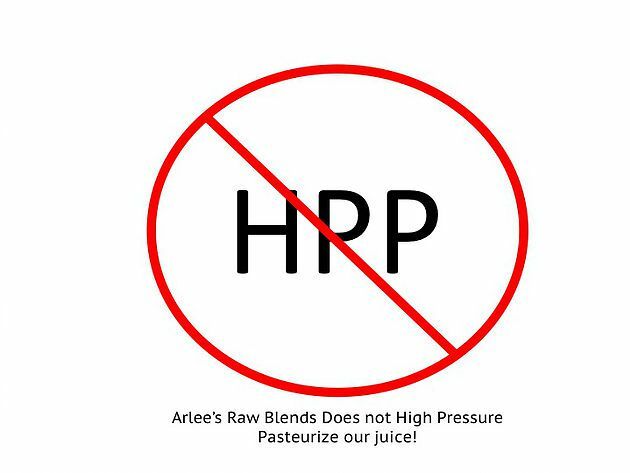 Any type of processing that extends the shelf life of Arlee's Raw Blends is not aligned with our business philosophy and not natural. You can rest assured that Arlee’s Raw Blends are cold pressed daily from 100% organic fruits and vegetables.